This sword belongs to Saijyo sakuranking. Habaki : Gold foiled and silver double Habaki. Blade length(nagasa) :　72.0　cm or 28.34 inches. Shape : Wide and thick Katana with large Sori. The Kissaki is large. The blade is powerful. Hamon : Nie Deki, Choji Midare and Gunome Midare with many Ashi. Boshi: round shape with constriction. Special feature : Munetsugu was born at Shirakawa province and younger brother of Koyama Munehira. He studied from Kato Tsunahide which is called Koyama so-bei. 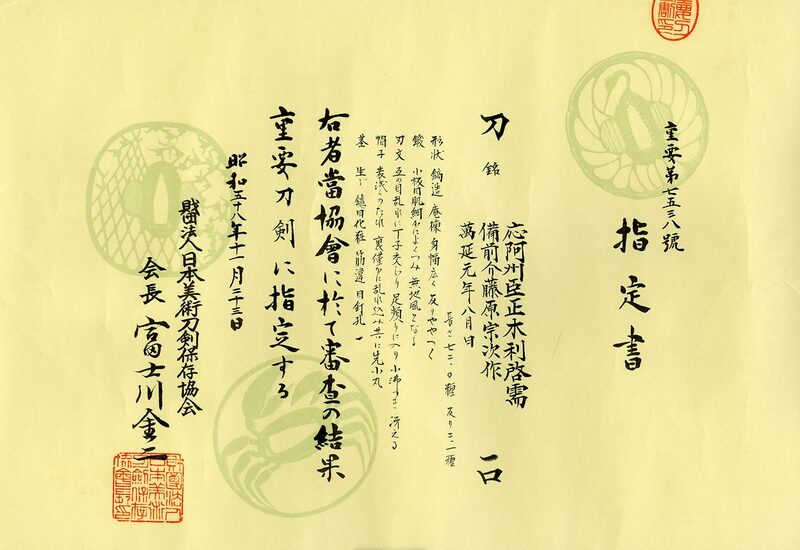 After that he moved to Edo and sword maker of the Daikyo Kuwana family. He lived Yotsuya Saemon cho in Akasaka Azabu and studied from Yamada Asaemon about cut well swords. Therefor his some swords exist Tameshigiri (cutting test) by Yamada Asaemon. in Iga city in Yotsuya near by Koyama Munetsugu without any greeting. So Koyama Munetsugu got angry and apply cartel to Kiyomaro. It is interesting Japanese culture at that time. He was making sword until Meiji 2nd year before Haito-rei（decree banning the wearing of swords). 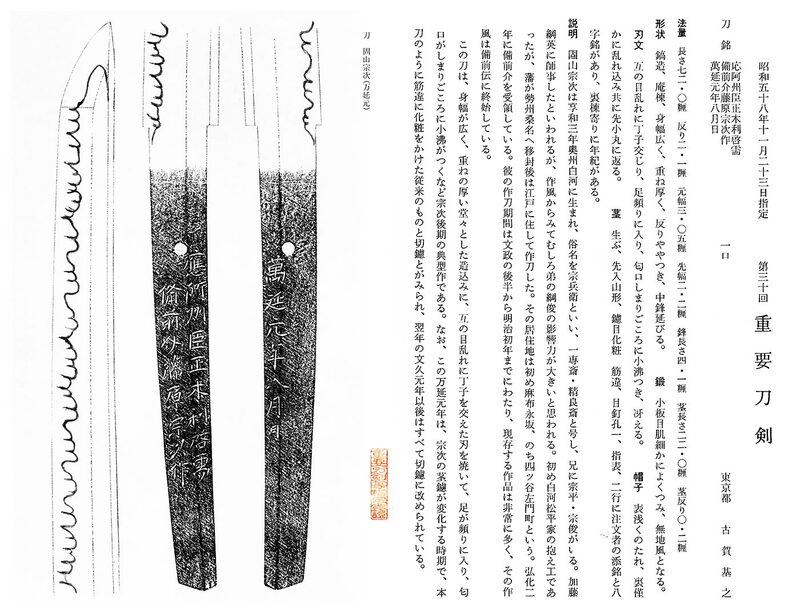 From Aoi Art: This blade was ordered to Koyama Mumetsugu by Masaki Toshihiro. He is the 7th generation of Masaki family. He was also called Masaki Matataro Toshitaka. He was a Samurai. He holds a fief yielding 130koku. According to his family tree, he passed away in 1861. The 130 Koku is 20,000,000JPY(the current price). He also has an excellent eyes for Japanese swords. This blade passed NBTHK Juyo. We recommend this sword for you. off shore of Sagami Uraga city off shore and apply freedom of trade to Japanese government.